This 4x4 inch card is made with a SU very vanilla base. Next is a layer of SU pretty in pink with Divalicious from Clear and Simple Stamps Diva Style Closet set stamped in SU purely pomegranate. The center stamped panel is very vanilla cardstock with the shirt stamped in pretty in pink and purely pomegranate then edged with dew drops. For a little extra detail I stamped a shirt in purely pomegranate on pretty in pink, cut out and mounted to the corner using popdots. Just a fun little square card! 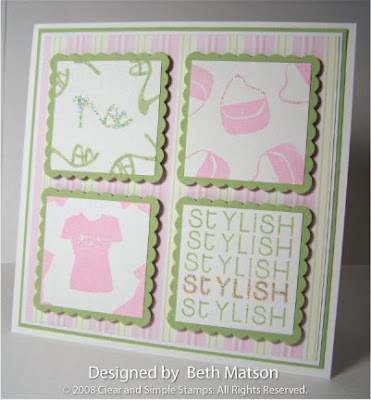 Stamps are from the Diva Style Closet set available from Clear and Simple Stamps. It's graduation time! I have a niece who is graduating from college this year and another niece and nephew who are graduating from high school. I decided I'd better get started on graduation cards! These cards have white bases and double sided papers from a Martha Stewart collection. The graduation stamp is from PSX and I made the caps. I sat the other evening and put together 18 caps for use on cards. I drew the caps and mortarboards on bassill cardstock then cut them out. Next I threaded some embroidery floss through the center of the mortarboard pieces for the tassel and attached the mortarboard piece to the cap with a popdot. A simple card that I think works great for female and male just by changing up the colors. Thanks so much for stopping by. 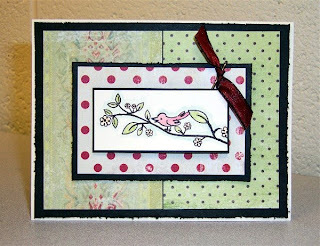 This is a 5 1/2 inch square card made using the Diva Style Closet set from Clear and Simple Stamps. I stamped the purse and shirt squares with SU Pretty in Pink and the shoes and stylish square with SU Certainly Celery. Next I added some pink highlights to one of the stylish words to make it stand out and then added crystal stickles to the stars on the shirt, the handle and button of the purse, the center shoe and the pink highlighted stylish. Each square is matted on a certainly celery scalloped square and mounted with dimensionals. The designer paper is unknown with a mat of white and certainly celery all on a white base. I love the versatility of this set! Have you checked out Clear and Simple Stamps? Clear and Simple Stamps was created by a mother - daughter duo and has grown ever since. Both fashion designers by trade turned fanatic stamp artists. While the daughter spent time as an editor at the world's top fashion magazine and the mother starting a new hobby as a stamp enthusiast, the idea to create trendy, clear, polymer stamps with style was born. It all started with sketching Simple Darlings. The owners love fashion, and all the great accessories that go along with it. But why make just plain flat sketches? They have turned their fun and fabulous designs into stamp art! Each image is hand illustrated and transformed into a clear polymer stamp. To sum it up in one word, Clear and Simple Stamps style is 100% DIVALICIOUS and is here to spread a little diva style one stamp art project at a time. I was recently selected to join their design team and am happy to share my projects with you. Let's start with this altered prima can. 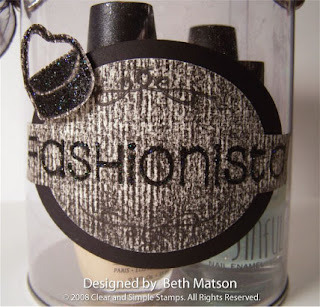 I stamped the shoes and purse stamps from the Diva Style Closet set in black and then went over them with my black stickles to make them sparkle. Once the stickles were dry I cut them out. I cut a circle for the lid and attached the shoes. 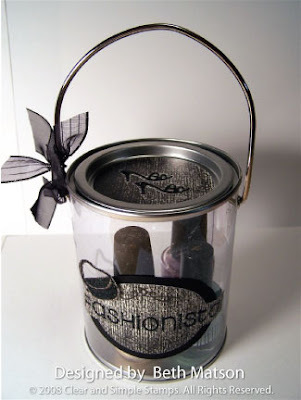 For the label on the can I stamped "fashionista" on a large piece of designer paper and then used my oval coluzzle to cut the oval shape but left the ends extending past the oval. I matted the label on black and then added black stickles to the letters. I mounted the label with tacky strip and added the purse with dimensionals. For the finishing touch I tied some ribbons to the handle. Here's a closeup of the label on the front. For my photos I dropped in a couple of bottles of nail laquer but how cute would this be with a bottle of polish, a buffing block, a nail clip, and a pair of fishnet stockings! Thanks so much for stopping by and don't forget to check out Clear and Simple Stamps. 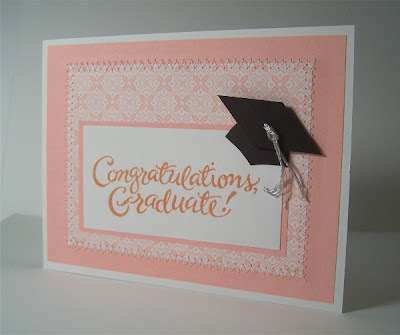 They just added some adorable grad stamps to the store! My card for today measures 5 1/2 inches square so that I could use a 4x4 coaster. I painted the one side of the coaster with walnut stain Distress Crackle paint and let it dry. Once dry I ran my tea dye distress ink pad over the coaster and then sprayed it with my mister so the ink would cover the entire piece. Next I inked up my Uptown Rubber Stamp collage stamp with Adirondak Earthtones in pitch black and stamped it on the coaster. The fun part of the crackle paint is that you can stamp on it and the image takes on the crackle effect but doesn't get blurry or distorted. It's like magic! I sponged peeled paint distress ink around the edges of the coaster and then mounted the verse panel on it using pop dots. The patterned papers are from the Me & My Big Ideas Coastal Culture pad. I got the verse from a friend and the name on the side of it says Vicon Inc. I think this will be a verse that I use quite a bit. Thanks so much for stopping by. I hope you're having a great week! 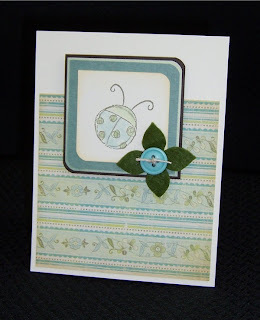 Here is my card for this weeks rubbernecker blogger challenge (RBC05). The colors for the challenge this week are yellow, red and green. See Jeanne's blog (Inky Paws) for more details on the challenge. 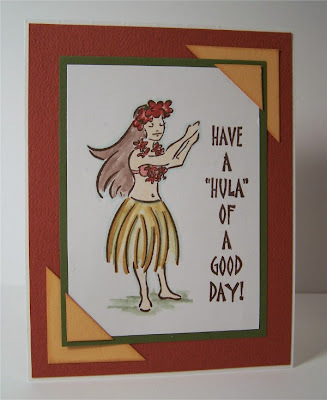 The hula girl and sentiment are both from the Beach Party section at Rubbernecker. I stamped them in Timber Brown Stazon and colored them with reinkers. The green and red cardstock are from my local stamp store and the yellow is marigold morning from SU. I sponged the edges of the marigold morning corners for a little added depth. Thanks for stopping and make sure you check out Jeanne's blog for details on the challenge. It could be worth a $25 gift certificate to Rubbernecker! I had to try this resist technique with the new Kim Hughes "Nature's Silhouettes" set from Cornish Heritage Farms. I started with a piece of glossy cardstock and stamped Hero Arts wallpaper background with Stampin Up River Rock and let it dry. Next I inked up the tall leaf stamp with Ranger Clear Resist and stamped it on the glossy paper. I used a heat tool on it to make sure it was dry before moving on to the next step. 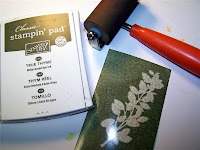 The third step was to brayer Stampin Up True Thyme over the entire piece. The ink doesn't stick to the leaf stamp because of the resist pad so the leaf stamp really jumps out. 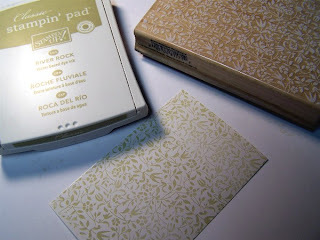 The key to make this ink pad work is to use glossy paper! I've tried it with non-glossy paper and it just doesn't work. I really like how the background stamp still shows through the true thyme but doesn't detract from the large leaf stamp. 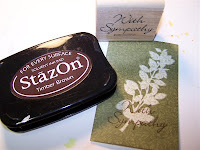 Finally I wanted to stamp a greeting on my image so I pulled out my Timber Brown Stazon pad and a retired greeting from Stampin Up. The stazon ink will stamp over the resist image. As always, thanks for stopping. I hope you all have a great week. Starting at 7:00 pm on Thursday we were under a Blizzard warning and the forecast called for at least a foot of snow. Thankfully we didn't get the amount of snow that was originally forecast but we definitely had the winds. 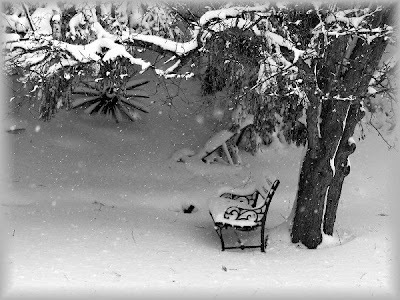 Here is a photo of our backyard this morning. Nothing like heavy wet snow in April. At least they are forecasting temps in the 40's for next week so it will all melt rather quickly. I'm totally ready for spring! 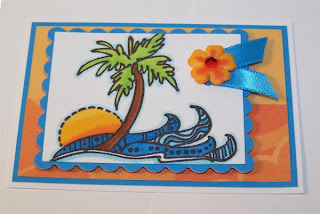 Each week there is a new Rubbernecker Blogger Challenge posted and I finally made some time to stamp a card for the latest challenge (RBC04). The color challenge this week calls for light blue, dark blue and a neutral color. I decided to use SU not quite navy, bordering blue and black. Although I see that I really have two neutrals because I stamped my images on white - oops! I used the Football Player Carrying Ball stamp from the Sports section of rubbernecker and the sentiment is from the Petite Word set from Stamp Oasis. 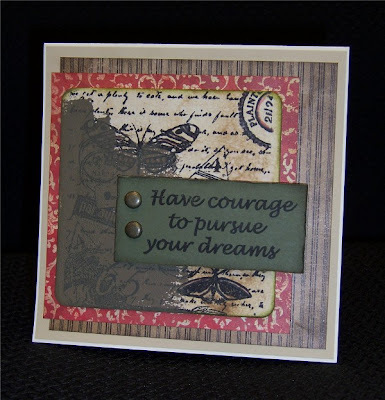 Both are stamped on Rosie Roadshow's textured paper with Palette hybrid black. The football player is colored with SU reinkers and an aqua brush. I added a row of black crystals down the side for a little extra detail. 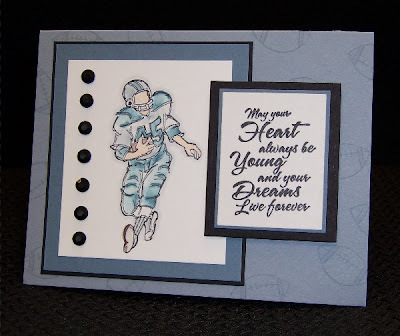 I also used an acrylic football stamp from a $1 set to stamp on the card base. Don't you think this would make a nice retirement card for Brett Farve? Check out Jeanne's blog for more info on the challenges. As always, thanks for stopping! As mentioned in my last post, I really enjoy the SheetLoad of Cards eZine so I made time to use the sketch from the April issue to make some cards. All of the cards have the same basic layout using SU very vanilla bases, chocolate chip mats and patterned papers from My Mind's Eye. The first two cards feature one of the birds from the Inkadinkado set Birds Galore. 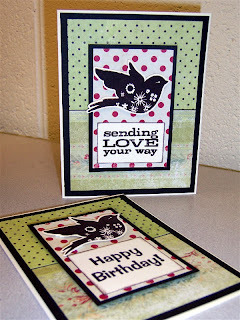 I stamped the bird with Colorbox dark brown chalk ink on SU very vanilla, cut it out and mounted it with pop dots. The Sending love your way message is from the Hero Arts Birds and Messages set. Happy Birthday is from a retired SU set. For the next card I used the Hero Arts Birds and Messages set again and added some distressing to the chocolate chip layers. I also added some ribbon to the card by using a bobby pin. 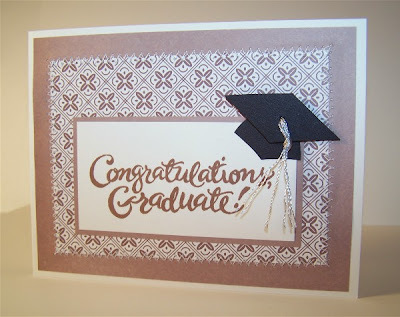 It's a nice simple way to add some ribbon to a card without punching any holes to attach it. The image was stamped with Timber Brown Stazon and colored with SU reinkers and an aqua brush. 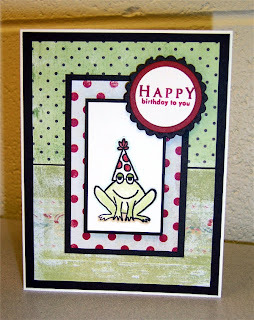 The next card uses a frog stamp from PaperSource. I stamped the frog with Timber Brown Stazon and colored him with SU reinkers and an aqua brush. 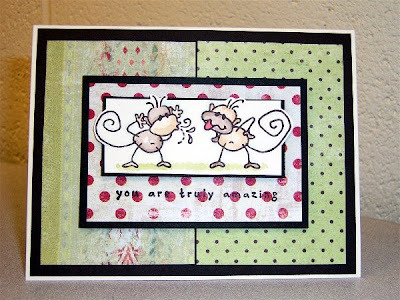 Then I stamped the birthday greeting from Papertrey Ink's Faux Ribbon set in Warm Red Colorbox chalk ink and layered it using my Nestabilities. Thanks so much for stopping and checking out my creations. Have a wonderful day! 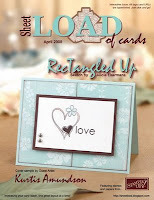 Are you familiar with SheetLoad of Cards? 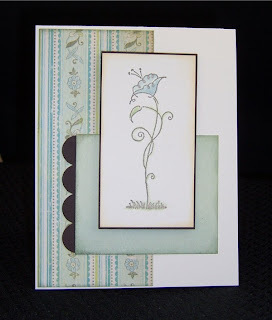 It is a Free Monthly eZine which features a card sketch and several samples using the sketch. Their motto is "Increasing your card stash, one great layout at a time!" 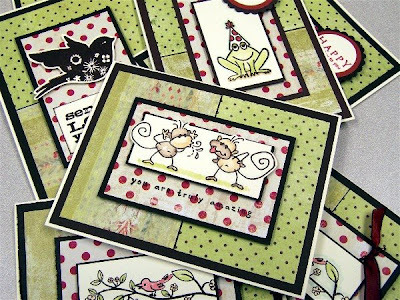 By using the supplies list and the cutting guides they provide, you can usually yield 6-9 cards from a couple of sheets of cardstock using the sketch in each issue! Here is a preview of their April Issue which is now available for downloading at http://sheetload.blogspot.com/. 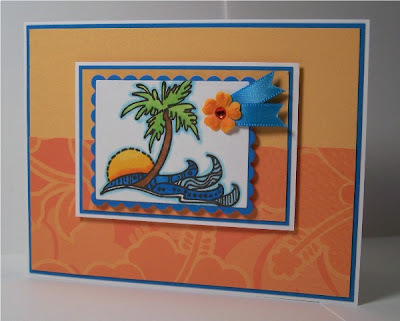 This issue features guest artist Kurtis Amundson (aka Stampin Kub on SplitcoastStampers). I had a chance to play with the sketch the other night and came up with these. I'll post more about each card in my next entry. Make sure to check out SheetLoad of cards for some great sketches and inspiration. Thanks for stopping! I was playing with my Gina K Designs stamps and thought the little man from the You Know You're Old When . . . set would pair up nicely with the potty from the Way to go! set for a birthday party invitation. 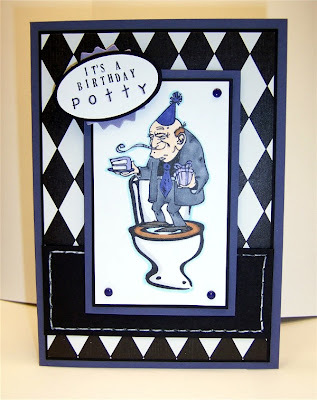 I stamped the man in palette hybrid black then masked him to stamp the potty. The images were colored with Copics then mounted on a black mat and a purple mat. Purple Bazzill brads were added to the corners. The sentiment was made using Karen Foster snap stamps. Then punched out with the fiskars squeeze oval punch and matted with black. These were layered onto a star burst chipboard piece that I inked with purple chalk ink. 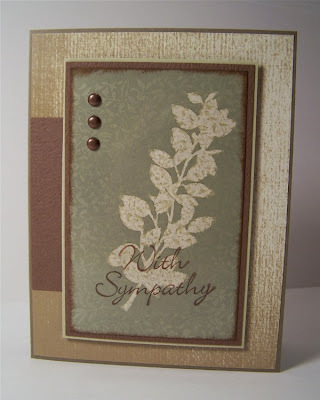 The black strip across the bottom of the card was paper pierced and faux stitched using a white gel pen. As always, thanks for stopping. Have a great day! 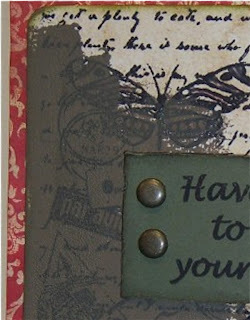 I made this ATC for a swap I participated in. The participants were supplied with the turquoise paper, the orange print paper, the ribbon and the crystals. I went with a white base and then a layer of the turquoise. Next I added a layer of SU marigold morning and covered the bottom half with the provided orange print. The image is from Inque Boutique. I stamped it in Palette hybrid black and colored with Copics. I used my rectangle nestabilities on it and the scalloped mat. These layers are mounted with pop dots for some dimension. To finish it, I added the ribbon and the prima flower with the crystal center. I used white primas and colored them to match using my copics. I made an extra ATC to turn into a card. Thanks so much for stopping by. I hope you have a wonderful week! so I just cut pieces and created layouts as I went along. For the first card I pulled out my retired SU Ladybuds set. I stamped the ladybug in SU True Thyme then colored her using SU Soft Sky and Certainly Celery reinkers and my aqua brush. I added some Tim Holtz Distress ink in Antique Linen around the edge of the image and then used my corner rounder on two of the corners. I also rounded the same corners of the mats. The blue is the reverse side of the print and then a mat of chocolate from PaperSource. The base and image are SU Very Vanilla. For the finishing touch I used my cuttlebug to make a felt flower and added a button to the center. 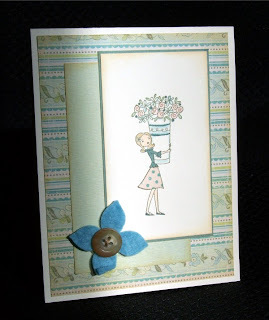 For the next card I changed the layout and used SU Sassy Stems for my image. All of the other supplies are basically the same except instead of adding any embellishments I added a scalloped edge using my SU slit punch and I used another piece of My Mind's Eye paper for the layer with the lighter shade of green. For the final card I used all the same papers again and another felt flower with a button center but I also paper pieced the girls outfit from Living Large. I colored her with reinkers and Copics. I didn't use up the entire sheet of paper but I will before I buy more! We got a couple of inches of snow last evening but thankfully it has melted already. Now if the rest of it would melt and the lawn would dry up a little life would be great. I hate the mud season, especially with two large dogs. It's the season of constant bathing! Every time they go outside they have to be rinsed off when they come back in. They are very good about it and will both run to the tub and stand there while you rinse them and dry them off but it does take up a lot of time that could be spent stamping! For now though we still have mostly snow with a few spots of bare lawn waiting to become mud. I hope you're all having a wonderful April 1st! Thanks for stopping.